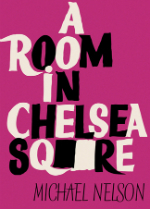 A Room in Chelsea Square by Michael Nelson was first published anonymously in 1958. It was reprinted in 1986 by Gay Modern Classics and is now being re-introduced by Gregory Woods in a very recent—and very handsome!—reprint from Valancourt Books. 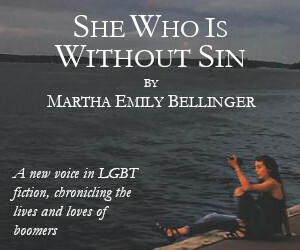 All in all, a nice package: a contemporary gay poet who hails from across the pond introducing a novel by a bygone gay Brit. And yet one might argue, it is the very lack of an affirmative or apologetic theme that is so impressive about [A Room in Chelsea Square]. Its main virtue is that it takes homosexuality completely for granted. There is anguish aplenty, but not about being gay. Most is about being unloved or unmoneyed. Is A Room in Chelsea Square a camp tour de force? Oh God, yes. 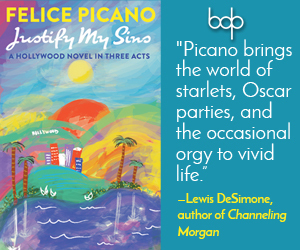 Told mostly through dialogue, the story brims with camp bitchiness—witty repartee that makes you laugh at the same time that it makes you cringe. Patrick, the middle-aged gay man who is one of the novel’s main characters, and who is rich—“very, very rich,”—is shopping in the opening scenes of the novel. When a shop assistant approaches him with a “Wonderful morning, isn’t it?,” Patrick’s response is “I always feel like buying something when the weather’s fine, so I suppose it must be.” A bit later, when he bumps into frenemy and ex-lover, Ronnie Gras, Patrick begins to harangue Ronnie. Is A Room in Chelsea Square a parade of negative images of gay men? Oh, God, yes. But is that necessarily a bad thing? I mean, haven’t you known men, both gay and straight, as flimsy and fickle as Patrick—middle-aged men with money who, like Patrick, are obsessed with youth and who use their money to entice the young (take, for example, the recent HBO movie Beneath the Candelabra, in which the character of Liberace uses wealth and influence to rope in a younger man). And if you haven’t known such men, wouldn’t you at least agree they’re stock characters? So that while A Room in Chelsea Square may not be “positive,” it’s not entirely inaccurate about human beings (or at least, not about make-believe human beings). And besides, A Room in Chelsea’s Square’s negativity has the higher purpose of satire. Here Woods disagrees with me. He feels because Patrick is only loosely based on literati like Peter Watson, who co-founded a literary magazine with the writer Cyril Connolly, and because Ronnie is only loosely based on Connolly, that the novel is not a satire. And yet, if we accept a satire to be “a literary composition, in verse or prose, in which human folly and vice are held up to scorn, derision, or ridicule,” then it would seem to me that the novel is a satire. What, to answer Wood’s question, does A Room in Chelsea Square satirize? Greed and consumerism, boredom and ennui, self-indulgence and …. Well, the list goes on. And what about the fact that a straight character kept by an older gay man dies? Is that death not, as Woods suggests, the requisite death that has to take place in all negative representations of gay men? No, in this case—and we should take such matters on a case by case basis, no?—in this case, it isn’t. The character in question is the young WWII-vet Michael, who is kept by Christopher, a character based on the gay writer Stephen Spender, and we are told by Michael himself that he’s bought a gun just to find out if he’s as suicidal as Christopher thinks he is. Michael, in short, is somewhat mentally unstable, a risk-taker toying with self-destruction. And it is Christopher himself who, despite all his flightiness of character, summarizes Michael’s dilemma: “You see,” Christopher tells Michael, “war, whatever else it may do, makes us forget ourselves. It gives purpose to our lives. It’s a wicked thing to say, but true. Living in the peaceful welfare state is terribly frustrating. We’re not equipped to deal with it. We grow bored.” It’s not Christopher or Patrick or Ronnie, in other words, which leads to Michael’s demise, but mental instability and boredom, a sense of uselessness. Boredom, anyway, is one thing you definitely won’t experience reading A Room in Chelsea Square. You might even be enlightened. The goal of satire after all is to foster change. I’m too young, and the wrong nationality, to say whether post-World War II England was “of” a bad time or good one, but I will go out a limb far enough to say that, no matter what time you find yourself in, A Room in Chelsea Square is a good book. It promotes good living by showing what good living is not.